Starting up this particular blog has been a long time coming because I was just not convinced until this moment to finally go ahead. 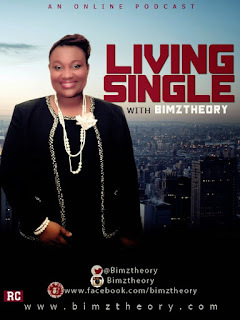 I initially just dropped podcasts on Living Single via my other blog www.bimztheory.com. However, I have been coming across so many supposed self-help articles from people who just write up stuff from material they get from Google rather than real life situations. I was married for 7 years and I have been on my own for 6 years now and counting so I fall under the category of a single mum as I have my 2 children from the marriage with me. It has and continues to be a journey that I take one day at a time because there are moments I think I have it all worked out and moments I just break down and feel overwhelmed by the reality of the situation. The truth is our Nigerian mentality is not really accepting of a woman that has been married before and left that marriage to be on her own for whatever reason. Many people are quick to judge and arrive at conclusions about that woman forgetting that it takes 2 to make or break a relationship. While I will never advocate for women to walk out of their marriages, unfortunately it happens for different reasons some genuine, some just on mere whims and others even a mistake and they wish they hadn't left. Whatever the reason though, if you find yourself in this kind of situation, it is not the end of the world and as long as God still allows you see another day, you should make the best of it. Do I have all the answers? Heck NO! Sometimes I don't even know what I am doing but the one thing I am very sure of is that we all need a support system from time to time and that is why this blog is finally seeing the light of day. Many people find themselves single either from choice or chance. So many people are getting older and still yet to get married and find themselves being stigmatised or laughed at (mature singles). For some people, it might be that they lost their partners through death, divorce or separation. Meanwhile there are also some who never got married but have children and they fall under the single mum/dad category. Livingsinglediary.com is a place where I will tell you as it is no holds barred. I will give you narrations of real life issues I have personally gone through or still going through and we can all be there for each other. I will also make confessions from time to time(Lol)and I will appreciate your feedback on any issue that might bother you. We can laugh together, cry together and most importantly, pray together and try and look for solutions on any issue you might be going through. I will also drop podcasts from time to time so you can hear me and not just read alone. Although it sounds very cliche that when life throws you lemons you make lemonade, that is the simple truth because if life throws you any curves or hitches, you just have to pick yourself up and keep moving forward despite all odds. Lets go on this journey together and always remember that YOU ARE NOT ALONE. For any questions or issues you might be going through, please send a mail to livingsinglediary@gmail.com and your comments on any issue I might write about is very important to me so please feel free to say it!